Andy McKee is considered one of the world’s finest acoustic guitar soloists. His dedicated online community has raised his YouTube video views in excess of 78 million plays and at one point he held the #1, #2 and #3 positions for Top-Rated Videos of All Time on YouTube. McKee’s online media success has impacted on both album and ticket sales, allowing him to tour internationally with over 200 live shows a year. McKee’s live shows are a true testament to his art of stringsmanship and engaging repartee. He manages to captivate both the every day music fan and guitar aficionados with his expertise and down-to-earth wit and humour. Whether it be explaining how his harp guitar tunes or why his frets are backwards, Andy maintains his love for both fan and guitar player. McKee’s unique skill allows him to transform the guitar from a simple stringed instrument to a dynamic farrago of sound. Andy’s deft talents give his music life through altered tunings, syncopated rhythm guitar taps and his textural use of polyphonic tones and drones. All of these are played on both standard sized acoustic guitars and a hand-built 12 string harp-guitar. His highly-developed two-handed technique is reminiscent of some of Andy’s cherished guitar mentors and heroes : Preston Reed, Don Ross, Billy McLaughlin and Michael Hedges. He honours the path blazed by these pioneers with his unique multi-layering approach as he alone plucks, strums, taps the strings and body to provide the illusion of a full band accompaniment. 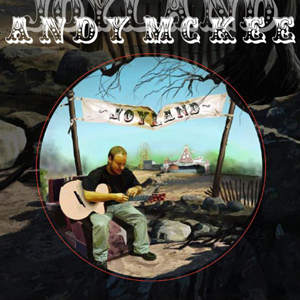 Andy was recently awarded the Acoustic Guitar Magazine worldwide silver medal award for fingerstyle in December 2008.